The brand new Mactip model has been released with two sizes, 9m3 and 15 m3. This body is built as a tipping, non-compaction refuse collection vehicle. The versatility of the Mactip bodies means they can be used for several different applications, however it’s primarily designed for glass collection and food waste. The body is constructed from high grade steel including a hardox floor for increased durability. 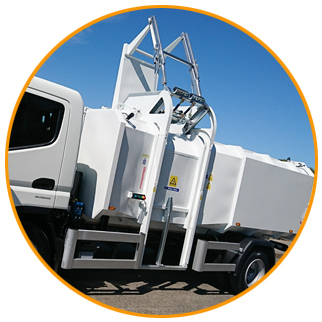 Such is the efficiency of the design of the Mactip body, excellent payload figures can be achieved, allowing the body to be mounted on smaller vehicles. This in turn has a significantly positive impact on your company’s payload to fuel consumption ratio. Loading can be done via single or double bin lifts to suit 80-1280ltr bins. Loading can also be carried out by hand, we facilitate this by including a hand loading door on the side of the body, we can provide a door on either side of the body should the customer require this specification. The bin lift can also come in pod form. For glass collection, the body will come with angled loading plate, lowered waste drop height into the hopper, lined loading aperture and low rave height of discharge, all designed for noise reduction. – Body and lifter “up” alarm on moving off. 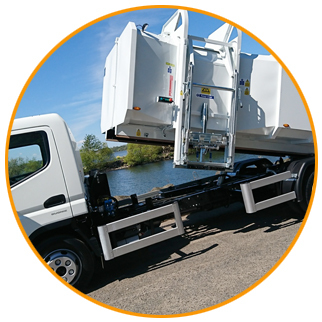 – Bodies compatible with underbody and bin lifter weighing systems. With health and safety of utmost importance, side loading is hugely advantageous in rural or carriage way collection areas, where the operators are better protected from incidents involving rear impact. This is a brief overview of what Macpac Refuse Bodies has to offer in our new Mactip models. Please contact us if you have any further questions or would like to know how we can tailor the Macpac Body to your companies needs.